The Bauchi State Government under the leadership of Bar. 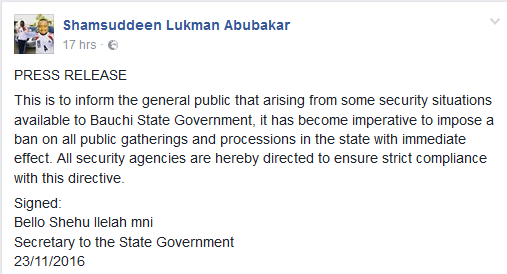 Muhammed Abubakar has banned public gatherings and processions in the state. A press release signed by Secretary to the State Government and dated November 23, says the ban takes effect immediately. 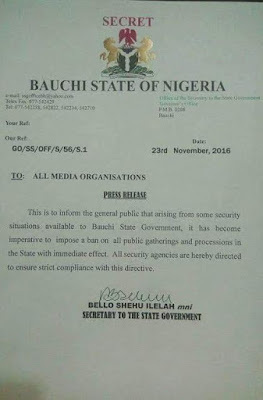 "This is to inform the general public that arising from some security situations available to Bauchi State Government, it has become imperative to impose a ban on all public gatherings and processions in the state with immediate effect. All security agencies are hereby directed to ensure strict compliance with this directive."